PARKERSBURG, W. VA. – Residential home designer Marla Bruemmer has a unique viewpoint on the placement of windows in the houses she creates. “I use windows as picture frames in very specific locations within the home to produce great views,” says Bruemmer, owner of Design Evolutions. 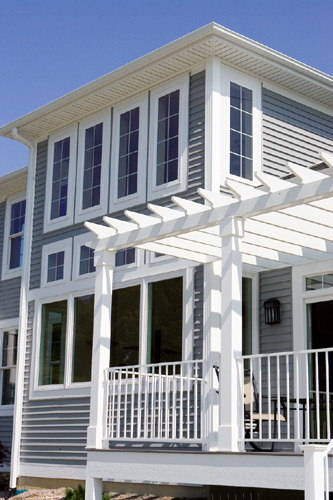 For more than 20 years Bruemmer has designed homes in Michigan and throughout the country. Many of her projects have been done for Powell Construction Services, LLC, a company dedicated to green construction. “My efforts are focused on developing designs that are friendly to builders and consumers,” says Bruemmer, a member of AIBD and NAHB. According to the award-winning designer, placement of windows in a home is her most important consideration when creating personal sanctuaries for her clients. When done correctly, she believes you can build in the middle of a crowded neighborhood and never realize it. “Windows create the spirit of the room,” says Bruemmer. “Light makes people feel good. Nature makes people feel good. Together, when combined through careful and abundant window placement, an entire home can feel ‘right’ for a homeowner. To support her theory, Bruemmer points to the fact that the Powell home was constructed to meet the NAHB Model Green Home Building Guidelines and is certified Green Built™. With a HERS rating of 53, Powell’s 5+ ENERGY STAR® rated home is also certified NAHB green guidelines Gold Level. Powell selected the Simonton ProFinish Brickmould 600 products for his own home because of his preference for the window’s durability and style. Designed for new construction applications, the versatile windows include an applied flat exterior casing to replicate the look of traditional wood windows, but with all the low-maintenance features of vinyl windows. Simonton Windows produces ENERGY STAR® qualified replacement and new construction windows and doors, including a line of impact-resistant products. For the second year in a row, Simonton ranked “Highest in Builder and Remodeler Satisfaction among Residential Window and Patio Door Manufacturers” in the J.D. 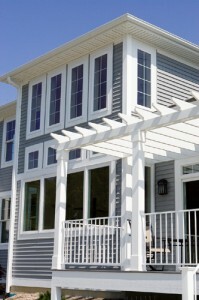 Power and Associates 2009 Builder and Remodeler Residential Window and Patio Door Satisfaction StudySM. Simonton was also ranked #1 in quality in the 2009, 2007, 2002 and 1998 Brand Use Studies sponsored by Builder magazine and has won three Best-In-Class Awards from Market Research Associates. Founded in 1946, Simonton’s hallmark has been to deliver its made-to-order products in five days or less. Part of the home and hardware business of Fortune Brands, Inc. (NYSE: FO), Simonton delivers award-winning products nationwide to key markets throughout the 48 continental United States. For information, call (800) SIMONTON (1-800-746-6686) or visit www.simonton.com.